Salute to all those Dads out there! Trying to put together a masculine card without frills and stuff was challenging today; I was having a creative block on coming up with something special. I started going through my collection of stamps and decided upon the La La Land Military Luka and Marci. These stamps are the ideal stamps for a military salute for that special military man receiving the card. This is my first attempt of trying to color camo gear. I am hoping with some practice it will look more like real camo gear; but for today's card it will have to due because I was too far into my project to turn back or start a plan B. Thanks for stopping in to view my latest creation. I hope y'all have a happy scrappy day!! 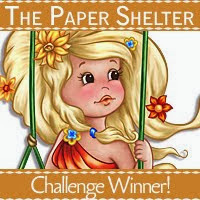 Hi.. You are the winner of a $30 voucher to Little Darlings Rubber Stamps. You were selected randomly after you left your correct puzzle piece answers on our blog hop. Please contact CustomerService@LittleDarlingsRubberStamps.com to claim your $30 store voucher!